Testing good tires on a wet track simulates rainy day driving. Checking the Tire Pressure is a very important skill. 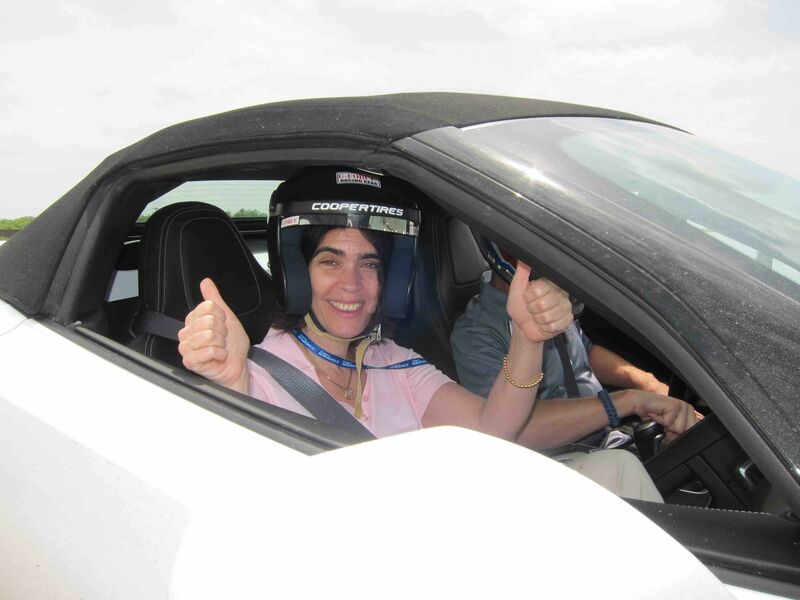 I was recently invited to learn how to be a safer driver at the Cooper Tire Vehicle and Test Center, located outside of San Antonio, Texas. Cooper Tire is based in Findlay, Ohio, where they have been making quality tires for 100 years. 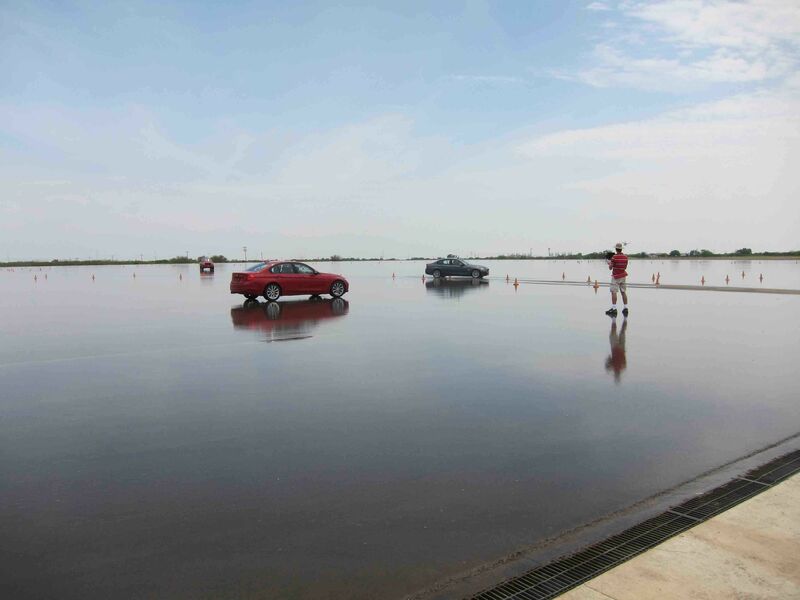 A small group of writer-moms were selected to test drive cars outfitted with Cooper Tire’s brand-new CS5 tires and improve their driving skills. When I was initially offered the opportunity, I hesitated. As a born-and-bred New Yorker, I know how to drive, but rarely actually get behind the wheel. My family owns a car, but that doesn’t mean we use it much. Driving in the Big Apple equals endless hours of stop-and-go traffic and aggressive cabbies. Don’t even mention parking. We get where we need to go fast by heading underground and riding the subway. I mulled it over and accepted the assignment. Being an infrequent driver leaves lots of room for improvement, so maybe I was the right person for the job. If I can drive the mean streets of Times Square, who’s to say I can’t handle wide-open Texas? We tested the new CS5 Touring Tire and compared it against a respected competitor under a variety of everyday conditions, including a wet track. These tires are crafted for real life use, so if you are driving yourself to work and the kids to soccer, these are the tires to consider. My knowledge of cars is limited, but even I know that a critical part of car safety is tire tread depth. Tires with the proper amount of tread give you the traction to stop and hold the road on curves. The Cooper CS5 is tailor-made for low-tech people like myself, thanks to Wear Square. With Wear Square, as your tire tread wears down, the shape of the tire pattern changes. When your tires are new, the pattern is square, but as they wear down, the square starts to dissolve and the pattern changes. This clear visual indicator lets you see how much tread life remains on your tires. Proper tire care is simple and just a few minutes is all it takes. With the summer road trip season underway, now is the time to start. Your most precious cargo is riding in the backseat, so get into the prudent habit of making sure that the tires that you drive on are in good condition. Here are four key things you can do to make sure that your tires are in safe working order. The number one cause for tire failure is under inflation. Under inflated tires may result in loss of vehicle control and accidents. A tire can loose up to half of its inflation pressure and not appear to be flat, so checking the pressure manually is very important. And, thankfully, very easy. All you need is a tire pressure gauge. It is a simple, pen-sized device that has a spherical shape on one end and a sliding scale on the other. Newer model cars have these monitoring systems built-in, but if your car doesn’t, it’s a very inexpensive tool to purchase. The correct air pressure for your car’s tires is shown on a sticker attached to your vehicle’s door, glove box or fuel door. Once you know the proper inflation level, remove the cap from the valve on one tire and firmly press a tire gauge onto the valve. Add air to achieve recommended air pressure. If you overfill the tire, don’t worry, just release air by pushing on the metal stem in the center of the valve with a fingernail or the tip of a pen. Then recheck the pressure with your tire gauge. Replace the valve cap and check the other tires. Don’t forget to check the spare. For an accurate read, make sure that the tires are cool when you check them. Take an extra moment to visually inspect the tires to make sure there are no nails or other objects embedded that could poke a hole in the tire and cause an air leak. FYI, properly inflated tires save fuel, so your purse will thank you too. Easy, right? I am ashamed to admit that I have never once checked my tires to see that they are properly inflated. Experts say they should be tested monthly, though only about 15% of drivers do this. Traction is reduced when tread is worn. To prevent potentially dangerous skidding, tires must be replaced when the tread is worn down to 2/32 of an inch. 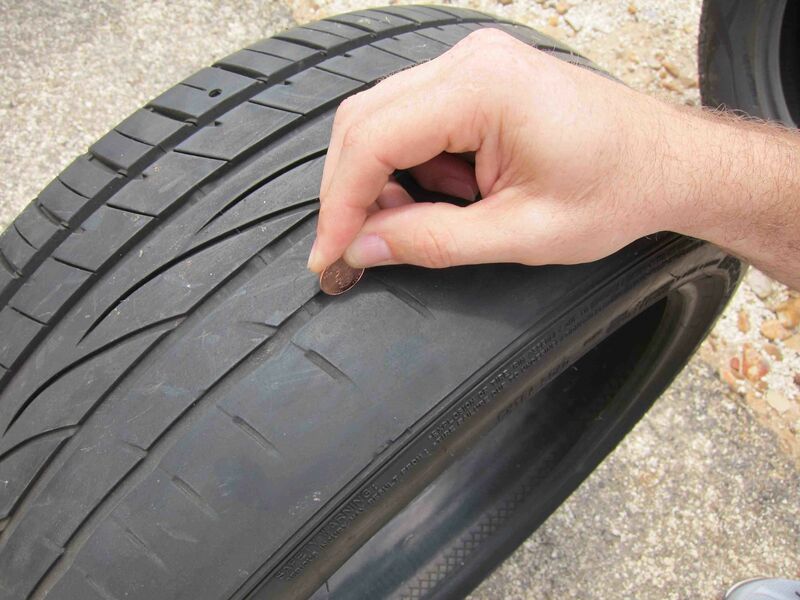 To test your tire’s tread, the only equipment you need is a U.S. penny. Place a penny into a tread groove. If part of Lincoln’s head is covered by the tread, you’re driving with the proper amount of tread. If you can see all of his head, it’s time to buy a new tire. Of course, with the Cooper CS5, the tire pattern clearly indicates how much the tread is wearing down. Regular rotation can prevent irregular tire wear. Always refer to your car’s owner’s manual for rotation recommendations. If no rotation period is specified, tires should be rotated approximately every 5,000 miles. A bad jolt from hitting a curb or landing in a pothole can throw your front end out of alignment and damage your tires. Misalignment of wheels in the front or rear needs to be corrected by a tire dealer. Have your alignment checked periodically or whenever you have an indication of trouble such as “pulling” or vibration. I had an excellent experience learning to be a safer driver thanks to the folks at Cooper Tire. Each participant had the opportunity to ride shotgun with Indy legend Johnny Unser. I was equal parts terrified and thrilled to be next to Johnny as he circled the track at break-neck speed. This ultimate New Yorker did enjoy her ride in a white Corvette with a professional speed demon. I certainly won’t be winning any NASCAR races myself in the near future. In fact, I won the “Driving Miss Daisy Award,” given to the most consistently slow driver. In spite of my snail’s pace, I was empowered as I gained confidence and greater understanding of the importance of properly maintained tires.